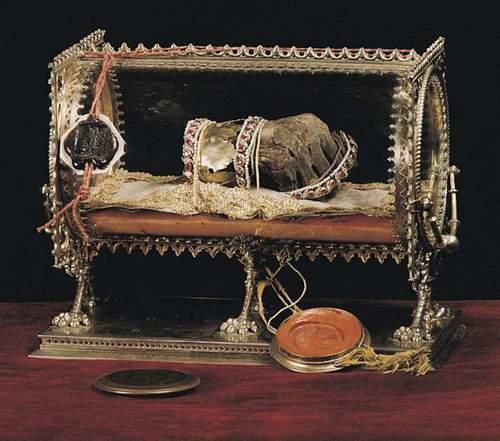 Mummified right hand of Stephen I of Hungary – canonized in 1083 A.D. The Carpathian Basin occupies a peculiar place in history. It was the ground where Roman-Germanic world met that of the Slavs and mounted nomad peoples, where no group had achieved sustained unity before the state of Hungary was founded. Its function was more as a kind of channel through which nomadic peoples, like the Ostrogoths, Gepids and Longobards, launched successful drives into the heart of Europe, or failed in the attempt, as in the case of the Huns (420-455), and subsequently broke up. The Huns opened up the road to Europe for the Germanic tribes, and the Avars opened up the Balkans to the Slavs, until the Hungarians finally closed the channel off. The dominion of the Romans and the Huns was confined to certain areas of the basin. The Avars (568-803) took control of the whole of it, while Charlemagne’s Frankish empire extended only to Transdanubia, the region’s most developed area. It was here, on the remains of the Roman, Avar, Frankish and Frankish-Slav cultures, that the Hungarians settled in the tenth century. After Arpad and his successors secured the area, they set up the first bishoprics and organized the first counties. This basin can be regarded as a missing piece of an enormous jigsaw, filled in by the establishment of Hungarian power, aided to some extent by accidental events. After the Huns and Avars, the setting up of Hungarian rule was accompanied by consolidation and modernization of the basin, and was assisted by hitherto unknown stability in East Central Europe. The Slav peoples occupying the borders of the German empire were split into two parts that would never reunite. The Northern and Southern Slavs, after being separated, set out on their way to the founding of their states and the discovery of their national identities.